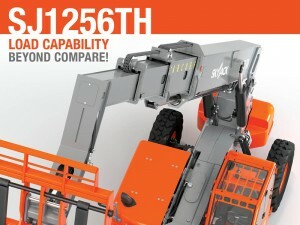 Skyjack has officially launched a new member of the Telehandler family: the SJ1256. Ideal for heavy-duty applications, the SJ1256 features capabilities such as lifting 12,000 lbs as high as 35ft. It has a maximum capacity of 17.1 m and can lift 1,000 lbs at maximum forward reach of 42.6 ft without deploying outriggers, whereas other machines can only lift up to 500 lbs or no load at all. The SJ1256 is currently only available in the US, but hopefully it will be available in Europe soon. See the full story about this exciting new machine here.